There is just one more summer season ahead before a law banning the production of a common air conditioning refrigerant goes into effect. Soon Freon will no longer be made and it will begin to be phased out of use completely. What does this mean for homeowners with HVAC units that rely on Freon refrigerant? Will you need to have your system replaced next year? AQM wants to help clear the air about Freon and older air conditioning systems. Here’s what you need to know. The Environmental Protection Agency works to decrease the use of chemicals that are harmful to the environment. In 1992, the agency decided that HCFCs (hydrochlorofluorocarbons), the chemicals which help refrigerators and air conditioners to cool, should be phased out. Studies have found that HCFCs have a contributing effect on ozone depletion and global warming. These chemical compounds are just a small part of the greenhouse gases affecting our environment, “but they trap thousands of times as much heat in the atmosphere as carbon dioxide,” states the NYTimes. For decades, Freon, also known as HCFC-22 and R-22, was the main refrigerant chemical used in residential air conditioning units and heat pumps. To help protect the ozone layer, the EPA has mandated that the production of Freon be stopped by January 2020. The good news is that new air conditioning systems made since 2010 no longer rely on Freon. Most newer AC units use a refrigerant called R410A, or Puron. This chemical is an HFC (hydrofluorocarbon), but has been shown not to harm the ozone and, since 2015, has become the standard for residential air conditioning. Don’t worry. Many homeowners that would be affected by this new regulation have already switched to more environmentally friendly refrigerants. HVAC professionals have been phasing out freon gradually over the past eight years. Older air conditioning systems that have been replaced according to schedule were likely switched out for R410A units. Freon is really on an environmental hazard if it leaks or is disposed of improperly. Freon-based HVAC units that still function properly don’t need to be replaced now either. Beginning in 2020, Freon will no longer be produced or imported, but limited amounts will still be available. Older systems can be serviced or recharged with refrigerant using stocks of HCFC-22 until the 2020 date. After that, technicians will need to source recycled Freon to keep an old cooling system running. 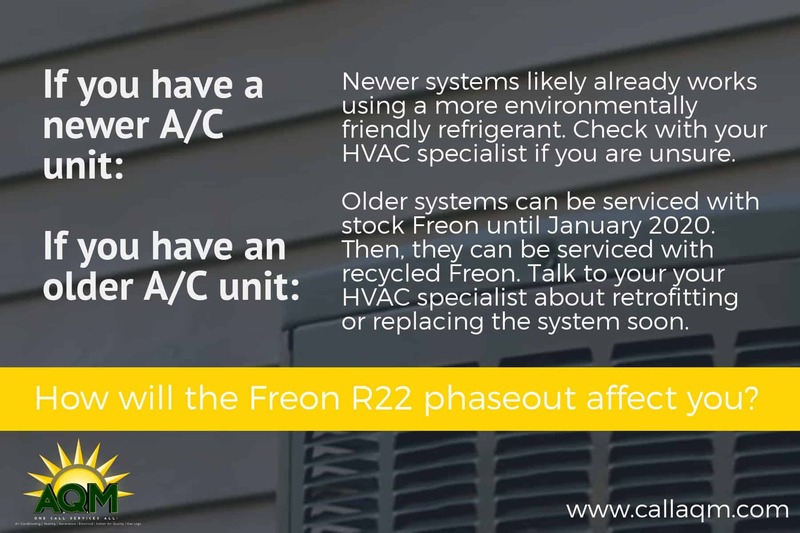 Up to 2020 – Older systems can be serviced with stock Freon. 2020 – The end of Freon production and importation. After 2020 – Older systems can be serviced with recycled Freon. How the new refrigerant regulations regarding Freon will affect homeowners starting in 2020 depends on the age of their air conditioning unit. Though the EPA does not require homeowners to buy new air conditioning systems, retrofitting older systems is a valid option. Unfortunately, you can’t simply switch to refrigerants that don’t harm the ozone. Newer air conditioners have compressors and other parts which work only with specific chemicals. This also doesn’t mean that the AC system has to be replaced. If the coils are compatible with R410A refrigerant, HVAC technicians can replace the outdoor unit without needing to modify other components throughout your house. This solution can be expensive, but it will keep your current AC system working. Plus, switching to R410A may actually make it more energy efficient. Routine service is more important for these retrofitted systems to prevent leaks and any harmful effect on the environment. If your air conditioning unit was manufactured prior to 2010, you may opt to replace it. After all, the average lifespan of an HVAC system is 15 years. Modern air conditioners are more environmentally friendly and also more energy efficient. Lower utility bills is a factor to consider when determining the best solution. Many homeowners choose to replace older systems rather than to retrofit them because it ensures greater long-term savings. Homeowners should only trust EPA-certified dealers technicians who are familiar with new Clean Air Act regulations. Proper installation, servicing and refrigerant replacement requires special training to prevent leaks of harmful chemicals. If you are unsure about the type of refrigerant used in your HVAC unit or would like professional advice on the best solution for an older unit, call AQM at (610) 363-3940. You can also request a quote online for HVAC system services.